We as the net user all are now familiar with YouTube and it is an American video-sharing website. YouTube allows users to upload, view, rate, share, add to favorites, report, comment on videos, and subscribe to other users. It contents including with video clips, TV show clips, music videos, short and documentary films, audio recordings, movie trailers, live streams, and other content such as video blogging, short original videos, and educational videos and many more. Today many teenagers are want to start their career as a Youtuber but don’t know initially which software is best for them. Sometimes they are using the cracked version of pro software, which is completely illegal and we are also against it. Even many videos are not well edited to attract viewers. The much free software is out there to create a beautiful video without piracy. YouTuber starts to think that software can help perfectionism their editing process like paid software. But some point, we could not find which type those video editors or which free editor is suitable for editing. Sometimes this creates a great confusion for YouTubers. Shotcut video editing software is available for Linux, Windows, and MacOS. Shotcut is an open source video editor which provides all the editing tool that will ever need. It supports a number of audio, video format, transitions, and effects. Multiple features are supporting it such as native timeline editing, mix and match resolutions and frame rates within a project, audio filters, mixing and effects, video transitions and filters, multi-track timeline with thumbnails and waveforms, unlimited undo and redo for playlist edits including a history view, clip resizing, scaling, trimming, snapping, rotation, and cutting, trimming on source clip player or timeline with ripple options. It also supports 4K videos. Lightworks is specially designed for a professional-grade video editing software. Lightworks also offers a free version. It is available for Linux, MacOS X, and Windows. It is an award-winning professional non-linear editing (NLE) software that supports video resolutions up to 4K, SD, and HD formats. It supports drag and drop feature, easy timeline editing & trimming, Wide variety of audio and video effects and filters. 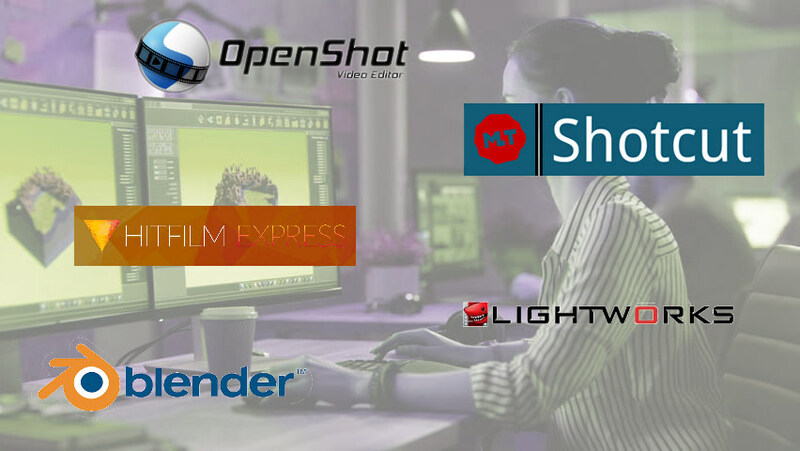 OpenShot has an impressive interface for free software. This editor offers video effects, 3D animation options, and animation framework. And its special feature is speedy editing. It will ever find for Linux, Mac, and Windows. The program is written in Python and it has support for many different videos and audio formats, drag and drops feature, video cutting, trimming, scaling, resizing, 3D animated titles, digital zooming, and video transitions. Blender is advanced and professional video editing software packed with exciting features. It is also open source and freely available, mainly used for visual effects, video games, animated films and 3D interactive application. This software is written in python, c, and c++. This software has main features such as skinning, 3D modeling, texturing, UV unwrapping, smoke, and fluid simulation. It is specially designed for computer graphics in video editor that are rendering, video graphics editing, animating, sculpting, compositing, match moving, camera tracking, particle, and soft body simulation. Windows, MacOS, and Linux all are supported. Hit Film Express is a full professional grade video editor which is also free. It has everything that you will need to support your expanding editing skills. It supports Windows and MacOS only. This editor supports almost every video and audio format and has over 180 visual effects. It also provides tutorials and training videos which can teach you how to use them. It’s a good setup for new users. So, that’s all - hope this list may help you to choose the right tool for your YouTube career. Thank you!